Man In White Shirt Sitting At Table Studying Construction Plan At Meeting. Man in white shirt sitting at table studying construction plan at meeting. He is holding a magazine with a city plan and symbols. Carefully read the information and considering illustration. It's not just a magazine, but beautifully decorated and comfortable information to work with, all data is divided into chapters and supported by drawings and sketches with examples. Beside him on table his phone and a bottle of water and a red plastic disposable Cup. Construction worker looking at his watch. 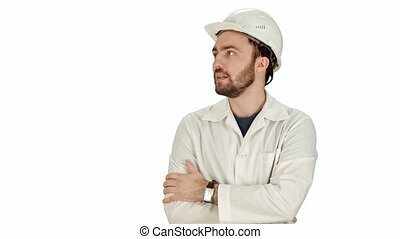 Builder waiting for a meeting on white background. Professional shot on BMCC RAW fith high dynamic range. You can use it e.g in your commercial video, Electrician, Construction Builder, Industrial Engineer, architect, scientist presentation. Beautiful loving couple sitting at a table in a restaurant outdoors on their wedding day. Lovers looking at each other, talk, laugh and clink glasses. The camera spying on them. The Big Day. 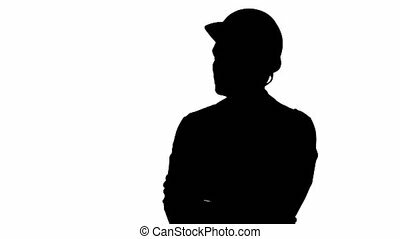 Silhouette Construction worker looking at his watch. Builder waiting for a meeting track matte. Professional shot on BMCC RAW fith high dynamic range. You can use it e.g in your commercial video, Electrician, Construction Builder, Industrial Engineer, architect, scientist presentation. Construction worker looking at his watch. 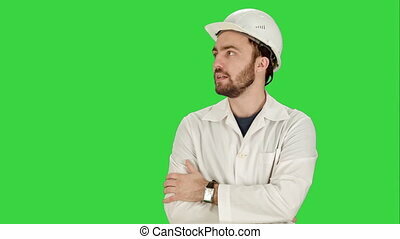 Builder waiting for a meeting on a Green Screen, Chroma Key. Professional shot on BMCC RAW fith high dynamic range. You can use it e.g in your commercial video, Electrician, Construction Builder, Industrial Engineer, architect, scientist presentation. 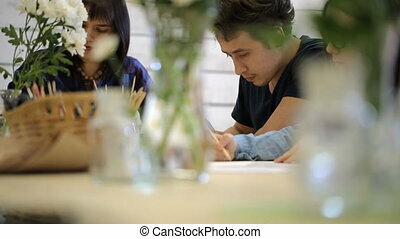 Man and woman writing while sitting at table in comfortable office. 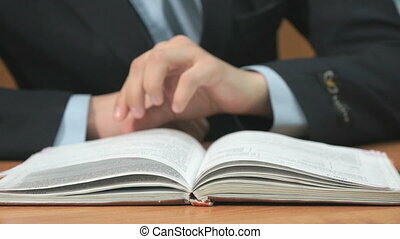 Two people are at desk opposite each other, make notes on white sheets with pens. 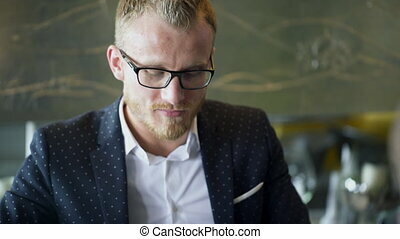 Attractive blonde dressed in blue classic shirt and man in gray suit, fill out applications forms carefully, without distracting from important process. 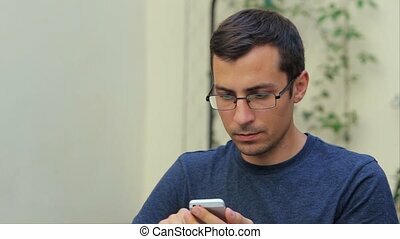 Young employee writes with pen sitting at table indoors. Man dressed in stylish business suit an shirt with black tie. 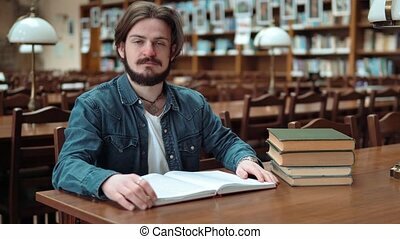 Young male professional works with project, sitting at table in cafe. Concept: workflow, trendy place, busy staff. 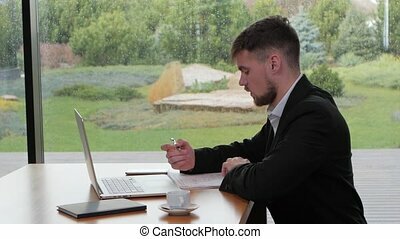 Young businessman is working with business plan sitting at workplace in office, male employee looking, writing on documents with charts at table in modern interior. Concept: business strategy, planning, doing job. 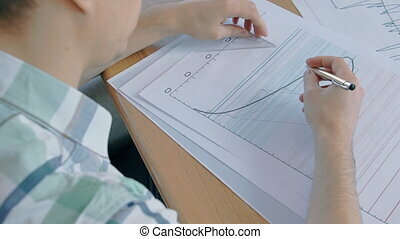 Women and man draw by pencils on sheets sitting at wooden table. There is basket with colorful pencils, glass with graphite ones and two vases with white flowers. Man wearing black t-shirt sits in center. He draws, looks on other side on neighboring picture and continues drawing. On left is girl in glasses and jeans jacket. On right is woman in checkered shirt. They draws also intently. Flowers and other things foreground almost hide women. This is team creative studying. The portrait of young male engineer who is sitting at the table in the office. The man in purple shirt and with blue eyes is looking to the camera. The white protective helmet, paper blueprints and cup of coffee are on the desk of professional. 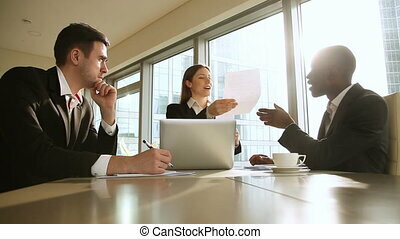 Three young people in the office discussing something sitting at the table. Two beautiful girls and a guy with a beard and a fashionable haircut. One girl is wearing a casual plaid shirt, has long dark hair, the other has short hair and black and white business suit, and rings and bracelet. Man is dressed in a blue trendy sweater. 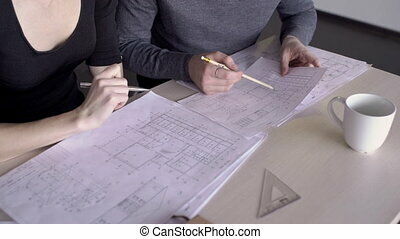 They look at architectural blueprint lying on the table and talk animatedly. Maybe they are students who prepare the project, or may be colleagues at work. 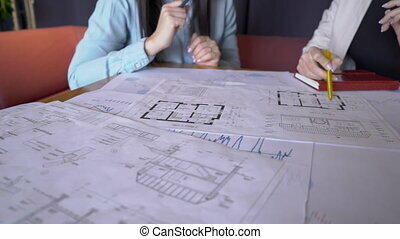 Young employees work on blueprint at table in modern office. Two professionals are in working process with project in international company. 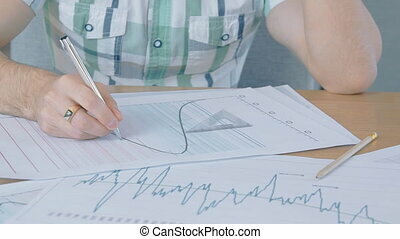 Man and woman examine documents carefully, pointing at objects with pen, taking notes on paper. On desk there is ruler and white ceramic mug. 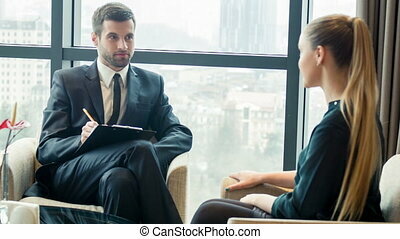 Business man at table with a designer met at office to develop project. 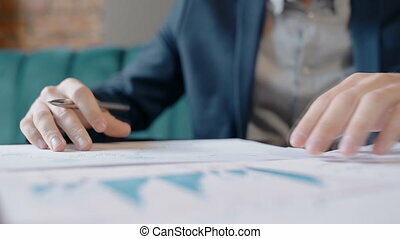 Client draws layout of his plan and freelancer records creative ideas in document sitting at desk. Young business partners are discussing blueprint at table in large company. 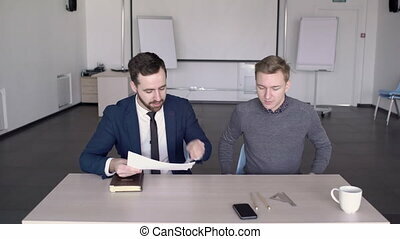 Two men are at meeting sitting at desk in modern office. Successful businessmen met with shaking hands to consider new investment project, in comfortable working place where there are documents, telephone, rulers and white magnetic boards in background. 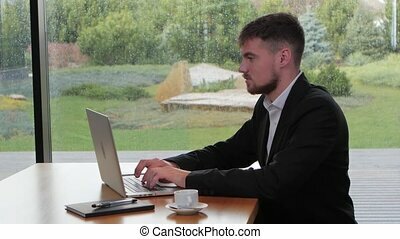 Young professional is working with documents, writing at table in modern office, busy man doing work with blueprint, holding pen, sitting at desk in company. Concept: corporate, paperwork, occupation. Friends talk happily with each other sitting at table. Man laughs at witty jokes of his girlfriend. He admires idea that she explains to him using schemes that lie in front of them on table. Students discuss educational materials from lesson of architecture that they have already visited. 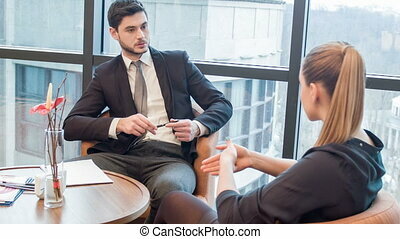 Male asked woman to explicate him some details that he cannot understand without outside help. Female agrees to help him with pleasure. He is ready to hear her with interest. Colleagues communicate on the meeting at the business lunch in the cafe . People sits at the table. Young businessman talks with his partner eating food. Handsome man looks on the companion. He is smile and happy. It is professional conversation. Beautiful male is dressed in formal garb, black suit and white shirt. He has glasses, wristwatch and wears beard. 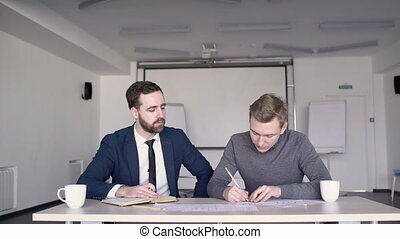 The two realtors works on the report sitting at the table in the co-working room. The papers with house schenes and market situation charts lie on the desk and the professionals outlines the most important details uing the pencils in their hands.